[tweetmemedigg] Anyone with children will know that ‘do as I say, not as I do’ is a hollow remark – as bemusing for a child as it is unconvincing for an adult. And it’s not suprising when you consider that only 7% of our person-to-(little? )-person communication is verbal. So why don’t we purposefully communicate using actions? Here’s 3 examples that do exactly that – and they’re all the better for it. In addition to that – and much as you’d expect from The Hunter Blog – they all shape the way we live for the better. One: Landmines are an invisible danger to civilians – but, you know, you wouldn’t get caught out, would you? 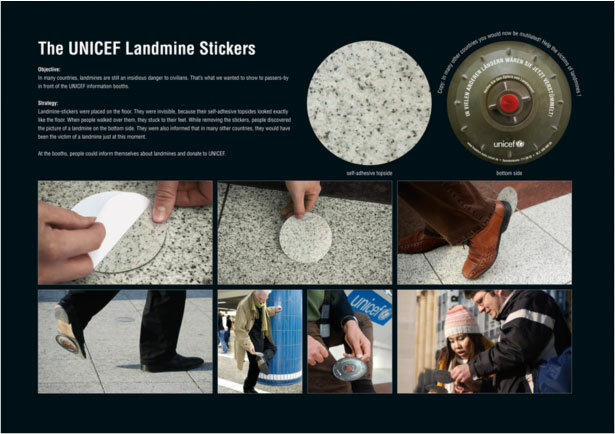 To demonstrate the dual terror of indiscrimination and invisibility landmine stickers with camouflaged self-adhesive topsides were placed on the floors of public spaces – spaces not walked by the poor bare-foot farmers of the developing world but by the sophisticated well-educated consumers of the West. These stickers went unnoticed until they stuck to someone’s shoe. Removing the stickers reveled the image of a landmine on the underside. And the text, “In many other countries you would now be mutilated”. A stronger message because you’re the actor? Definitely. *UURRGGHHH* whatever. Towels, Yaah. Paper. Bleugh. Trees. Amazon… blah: Is a lavatory really the place to talk about the declining tree canopy? No. A lavatory is not the place to talk about the declining tree canopy. These paper towel dispensers have a South America shaped viewing port through which you see a stack of green paper towels. As you pull a towel, you deplete the image of the tree canopy – one dry hand at a time. And no lame-o sign saying ‘Please use the stairs’ will do. Only a giant piano, rigged to a loudspeaker, and available for all, will cut the mustard. And if you want to pretend to be an Actor rather than simply an actor, then imagine yourself as Tom Hanks in Big on the F.A.O Schwarz floor piano (and no, you don’t have to wear the awful 80’s jumper).